V5PFES software which runs in the environment of MapInfo (above version 10.5) aims to support for Forest Protection and Development Fund in the provincial level as well as the national level to manage data and development of the PFES Map following the Circular No. 22 issued by the Ministry of Agriculture and Rural Development. - Automatic updating new version if the internet connection available. Note: In order to use this function, you need to uninstall the previous version in your computer at first, then download the version 3.6 and install normally. After that, the software will download automatically the newest version in your computer when starting the software. New features: Compile data according to the specific form of Thanh Hoa province. This feature is designed according to the order of Thanh Hoa province forest protection and development fund. 1. Standardization of forest change data. 2. Develop a PFES map layer. 3. Query data in Forms 12 and 13 of Circular 22. 4. Management of PFES database. 5. Support users, video channels about software modules, support consultant satellite images processing for forest status reviewing. Support & Contact: Please send your need to email: hotropfes@ifee.edu.vn. - Fixed updating K factor error if not used (all coefficients K are equal to 1). 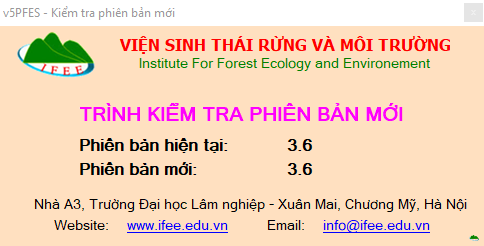 - Export of Excel lists about missing information of forest owners in the process of standardization of attribute of the forest change layer. - Improved data transfer from Shapefile to Tab. - Automatically update difficult level of communes under Decision 582 of the Prime Minister. Professional qualification training courses: "Using QGIS software in data processing about forest change and PFES map design." Training: "Developing maps of payment for forest environmental services"
Report on the project "Development of forest specialties of economic value in the period of 2011 - 2020"